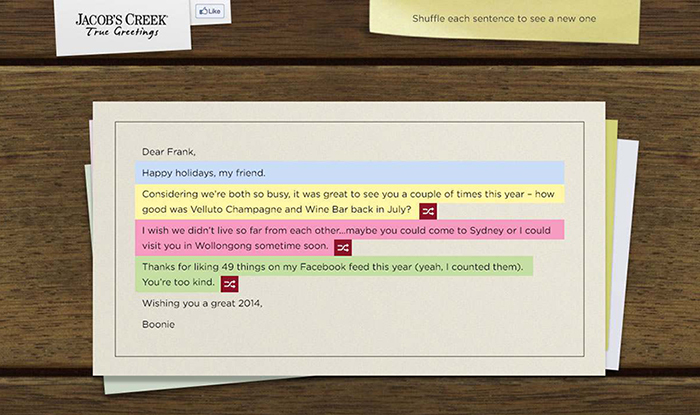 Australian wine brand, Jacob’s Creek, has come up with a quirky way of using social media messaging and analytics to help customers create highly personal Christmas cards for friends and family. The brand’s new online solution, True Greetings, draws upon Facebook relationships to create holiday ecards. The tool analyses the interactions between two people on Facebook as well as the events attended together, current locations, life milestones and the number of ‘likes’ exchanged, to generate a personalised message which users can place on one of four ecard design templates. The cards can then be shared on a friend’s Facebook wall, or via email. Jacob’s Creek is also offering the first 2000 Australian users the opportunity to have their messages delivered by traditional post for free. Jacob’s Creek global marketing director, Derek Oliver, said the True Greetings initiative is about giving consumers a unique opportunity to keep in touch with friends and family over Christmas. Last month, Jacob’s Creek also launched a new smartphone app as part of a long-term plan to build relationships with customers through their platform of choice. The Premium Drinks app offers free and discount vouchers by scanning sales receipts, as well as competitions, and loyalty program information.